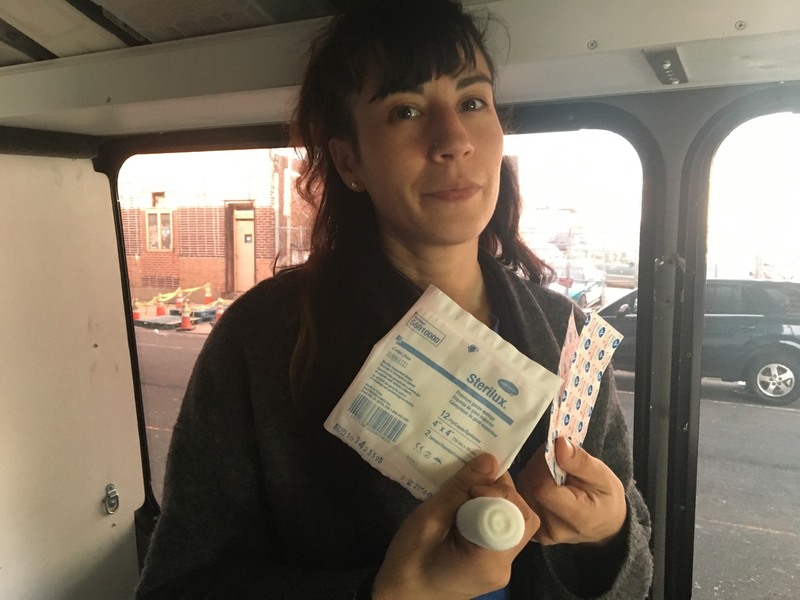 Amid Opioid Crisis, One Group Brings Injection Wound Care To The Patients In Philadelphia : Shots - Health News Infections from intravenous drug use are often hidden, under sleeves and beneath pants. These wounds of addiction may be buried in shame. They can also be serious, requiring surgery or constant care. 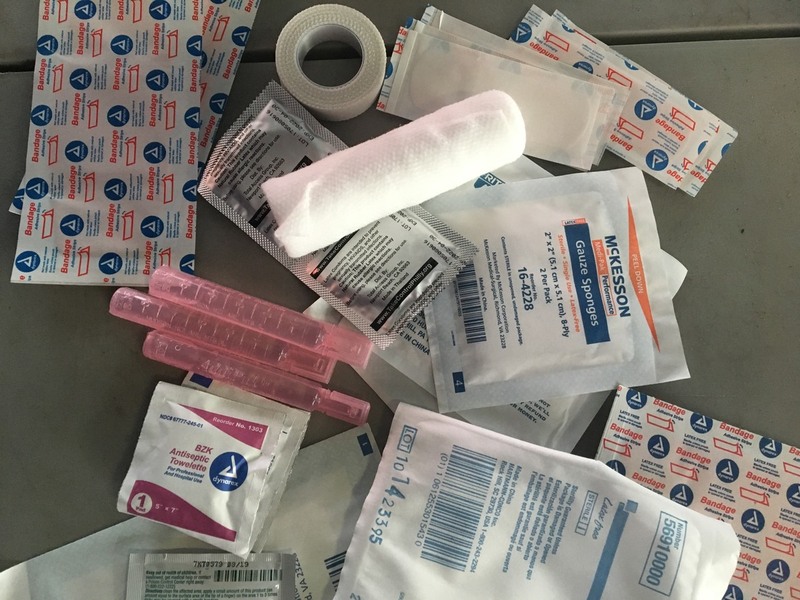 A spread of ointments, gauze, sterile water and other items stocked inside Prevention Point Philadelphia's mobile wound care unit. Dhand is a wound care nurse with Prevention Point, a nonprofit organization that provides addiction, health and harm reduction services in Philadelphia. Her job involves going out in a mobile-wound-care-van where she tends to skin and soft-tissue infections that often result from injecting drugs. She, and others, worry such wounds are on the rise as the opioid epidemic escalates, so the mobile unit is in the process of expanding through a grant from Philadelphia's Office of Addiction Services. This spring, it will travel to more places, more often, in hopes of reaching more people who might not otherwise get care. Sheila Dhand, a wound care nurse, treats many people who use drugs via mobile unit. Wounds related to injection drug use are often hidden under long sleeves as users try to hide their addiction. Without preventive steps and this kind of treatment, wounds sometimes get worse because bacteria and fungi can get into the skin, tissue, bones and even the blood. The repeated tears from needles can damage veins, causing wounds and worsening already existing ones. Some simple measures, such as using clean supplies when injecting drugs, may help reduce the infection risks — along with helping reduce the spread of HIV and hepatitis C. Untreated, such infections can become really serious. "They can lead to amputations, they can lead to death," Dhand says. "They can lead to long-term, really expensive hospitalizations. They can lead to a valve replacement in the heart. So these are serious complications that cause pain and suffering and are really expensive." A 2015 study of a public hospital in Miami found that infections related to injection drug use cost the county about $11 million in a year. That, in part, prompted Miami officials to authorize the opening of a needle exchange, with proponents stressing that the availability of clean needles and other supplies can help reduce the infection risks for those who continue to inject drugs. Philadelphia, meanwhile, has been reviewing whether opening a safe injection site — a place where people could inject illicit drugs under the supervision of a health worker — might also help reduce hospitalizations for skin and soft tissue infections. While the debate over that idea continues, Prevention Point's wound care van makes its rounds, bringing its exam table and bins filled with bandages, ointments, sterile water and alcohol wipes where they're needed. And for Dhand, the act of treating urgent wounds goes beyond helping the literal infection heal. It represents a link to other services and addressing the deeper wounds of addiction. "That's a really important part of it. It's not like, wound care [and then] goodbye," she says. "We'll also talk about: Have you overdosed in the past? Do you have Narcan? Do you know how to use it? ... I mean, you're cleaning someone's body, wrapping them up, and bandaging them up. It's really caring."